2K Walks will begin at 8:00 and end at 12:00 p.m RAIN OR SHINE. Refreshments, Giveaways, and complimentary T-shirts will be offered to all Adult registered awareness walkers —at all locations. Children under 10 years of age walk FREE! Children’s T-shirts are available to purchase on the registration form at a discounted price of $5.00 USD. 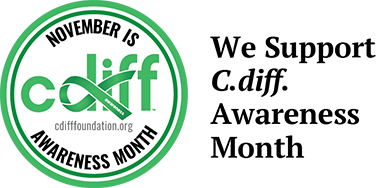 All proceeds raised will continue moving the C Diff Foundation’s mission forward and support the patient and family programs worldwide. Registration Fee: $20.00 USD/Each Awareness Walker. PHOENIXVILLE, PA 19460 – LEAD BY DAYLE SKELLY. TEANECK, NEW JERSEY – LEAD BY MICHELE MARTELLO. Lead by Dr. Martha Cloakie on Friday, May 17th. If you are unable to participate and would like to show your support, a Donate Button has been created with gratitude, and for your convenience. We extend our gratitude to the following Sponsors for their support and partnering with the C Diff Foundation in raising C.diff. infection awareness worldwide.